Personal: Parker Morse Bohn III (pronounced BONE)… Resides in Jackson, N.J., with wife Leslie and children Justin, Brandon and Sydney…Bohn’s other sons, Parker IV and Evan, live in Tennessee… Has his own fan club, the Bohn Zone, and website, www.parkerbohn.com...Would like to be an architectural engineer if he was not a professional bowler…Bohn is the brother-in-law of PBA champion Doug Kent (Doug’s wife Chrissie and Parker’s wife Leslie are sisters…Named to the Team USA “Dream Team” in 2008...Is a sales representative for Brunswick. 2018: Finished 13th in Xtra Frame Gene Carter Pro Shop Classic. Career: In 2015 won Cheetah Championship at GEICO WSOB VII for 35th PBA Tour title defeating Paul Moor of England 210-206 and moving into fifth on all-time list. Won PBA Players Championship for 34th Tour title tying with Mark Roth for fifth all-time and third major. Won championship match in two frame roll-off after 237-237 tie with Ronnie Russell. In 2012-13 Won PBA World Championship for second career major and 33rd title overall by defeating Jason Belmonte in championship match, 254-227. Win was first since 2008-09 season...As top qualifier, finished second in WSOB V Cheetah Championship losing to Wes Malott in championship 249-163...Won titles in five straight seasons from 1997 through the 2001-02 campaign, collecting a total of 18 titles during that span…Won a career-best five titles in 1999 and again in 2001-02, earning the PBA Player of the Year Award in both seasons…Won George Young High Average Awards and Harry Smith Point Leader Awards in both 1999 and 2001-02…Four-time winner of the Steve Nagy Sportsmanship Award…Shot a nationally-televised 300 game in the 1998 USBC Masters in Reno…Won a career-best eight consecutive televised matches between May 16, 1998, and Feb. 6, 1999, taking home four titles during that streak…Won 2008 Cheetah Championship for his 32nd career Tour title (tied for fifth all-time with Norm Duke)...Won Miller High Life Classic in April 2014 for first PBA50 Tour title...Won 2015 PBA50 Pasco County Florida Open by defeating Norm Duke 263-222 for second PBA50 Tour title and Treasure Island Resort & Casino Open by defeating Pete Weber in championship match 259-238 for third career PBA50 title...Won Dave Small's Championship Lanes Classic for fourth career PBA50 Tour title. Also finished second in PBA50 Players Championship and third in UnitedHealthcare Sun Bowl In The Villages...Owns 25 PBA regional titles and four PBA50 regional titles. 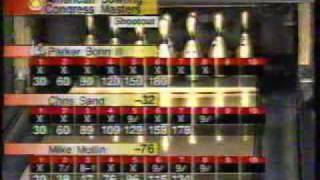 1989 – Glendale Heights, Ill.
Mixed Doubles with Aleta Sill, Reno, Nev.
2001-02 – Doubles with Rohn Morton, Reno, Nev.
2001 - USBC Masters, Reno, Nev.
2015 - PBA Players Championship, Indianapolis. 2015 - Pasco County Open, Welch, Minn.